During the past seven months, I have achieved some of my wildest dreams. I’ve gone tower running, learned how to holler, won a national championship in egg tossing, tamed orange habañeros, and run with burros in the Rocky Mountains. But now it’s time for me to concentrate on achieving a somewhat mundane yet equally worthwhile dream. Three weeks from today, I’m running in my first half marathon. What’s that, you say? It takes months to train for a half marathon? Not weeks? Well, you’re right. Most training programs I’ve found on the Web (including the plan in the book that’s been sitting untouched on my desk for the past two months) aim to prepare you in about eight weeks. Of course, it’s not like I’ve been hibernating for the past two months. In fact, I’ve been running on a regular basis since June. The only problem is that none of those runs were longer than four miles. That’s why I decided to go for a long run yesterday morning. Knowing that this would be in stark contrast to my shorter runs, I took a few necessary precautions. I loaded my iPod shuffle with a collection of upbeat 80s music and podcasts of This American Life and The Story. I bought a Camelbak hydration pack, filled the water bladder to capacity, and stuffed the pockets with a few packs of energy gel and my cell phone—just in case I needed to call an ambulance at the end of the run. I also found a place to run where the miles were clearly marked. 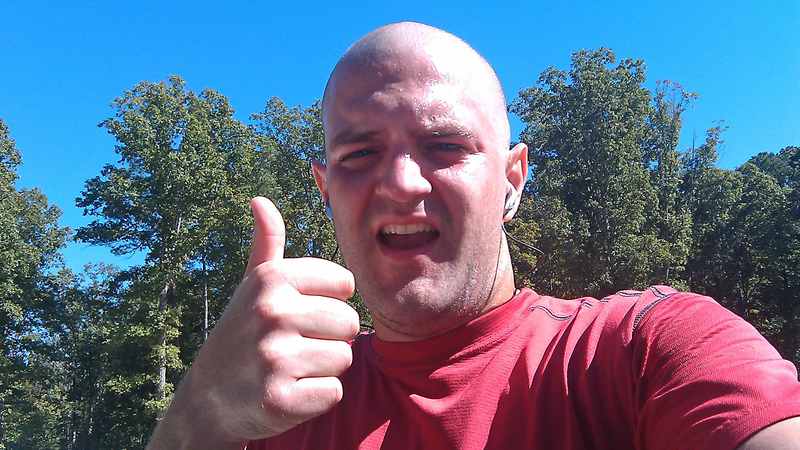 It was 10:30 a.m. and I planned to run 10 miles. Five miles out and five miles back at an estimated pace of nine minutes per mile. I would be back to the car in an hour and a half. After the first three miles, everything was going as planned. I felt great. Actually, I felt so great that I knew I could run farther than 10 miles. So I did. I cruised past the 5-mile marker, past the 6-mile marker, all the way to the 7-mile marker. A few minutes after 12:30, I returned to the parking lot. I had been running for two hours and nine minutes. I had run 14 miles. Even though I could barely move my legs by the time I returned home, I felt amazing. Even though most of the moving parts of my knees feel like they’ve been replaced with concrete today, I still feel amazing. Mainly because I set a goal and exceeded it. Also because my soreness gives me a great excuse to lie on the couch and watch football all day. I may have to do this more often. Read the book “Born To Run” by Christopher McDougall. You’ll feel like such a wimp for only going 14 miles. Also, add “Can’t Stop Running” by Todd Rundgren to your IPod. Mike, I actually read that book last year. It’s a terrific read. I’m thinking about reading it again. (On a cool side note, I recently realized that on facebook, there is just one degree of separation between myself and Caballo Blanco… how awesome is that?) Thanks for the tip on the podcast. You do know your grandfather (the one who shaved his head one summer and went partially bald) won the mile race in the Pittsburgh city schools his senior year. Looks like you got his running genes. Hopefully you did not get his bald gene and your hair will grow back on top!